Just insert the Barlow lens between the eyepiece and the telescope and you will double the magnification. At the same time you will retain the comfortable eye relief of the longer focal length eyepiece. blackened lens edges result in optimum contrast and image sharpness. 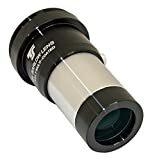 This 2x Barlow Lens can be used both visually and photographically. For visual use it accepts 1.25″ eyepieces with a resulting magnification factor of 2x. For this application the Barlow works the same way like any other Barlow lens. The special feature of this Barlow lens is its integrated T2 (M42x0.75) thread which allows it to be used photographically. For example you can screw it directly into the T-ring of your DSLR camera. The resulting magnification factor for this use is 2.5x. This of course works also with other cameras with T2 thread, but the factor may be different, depending on the distance between the Barlow lens element and the camera’s sensor. This entry was posted in Astronomy Products and tagged 1.25, Achromatic, Barlow, comression, Fully, Lens, MultiCoated, Premium, Ring, Thread, TSB21T2, TSOptics by Celestial World. Bookmark the permalink.